However, I did find another category of agri-businesses who were asset light(er), cashflow positive and who exhibited rapid earnings growth. I’ve briefly mentioned this bunch before – Cherkizovo (CHE:LN) and MHP (MHPC:LN) stand out as the most obviously attractive peer stocks. 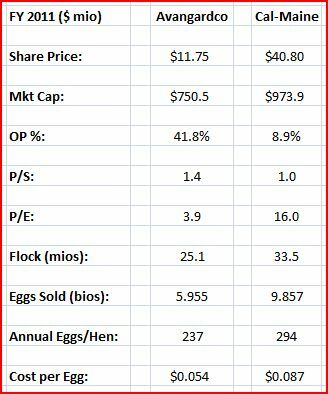 I won’t do a peer comparison, suffice it to say I concluded Avangardco has possibly the greatest growth potential AND the cheapest valuation. In fact, Avangardco owns no farmland, so its grain purchases are a key cost component and may offer a useful hedge for my Cresud and/or another potential Black Earth farmland purchase. So what’s Avangardco’s business? You might’ve guessed – yes, they’re a major player in the egg business! Actually, they’re the #1 egg producer in Ukraine & Eurasia, and ‘World Poultry‘ recently confirmed them as the #2 global egg producer (after Cal-Maine Foods (CALM:US)). They have a flock of 25.1 million birds, and produced 6.0 billion eggs in 2011! The majority of production’s simply sold as shell eggs, but 18% is processed/sold as dry egg products. I’m no culinary expert, but these products seem popular in certain parts of the world – my perception is that the US & Europe have a distinct preference for fresh eggs. Another 12% of revenues come from flock sales. This may seem low, but I’ve personal experience in persuading chicks to lose their heads and undress (I’m talking chickens here, of course! )…so I know laying hens aren’t so tasty or valuable! In the past couple of years, the company’s focused on two value enhancing strategies: i) selling direct and brand development domestically – 30% of shell eggs are now sold through supermarkets, and they’ve successfully launched their Kvochka (‘Mother Hen’) and Organic Eggs brands, and ii) exporting internationally – about 19% of sales now come from exports, primarily to MENA & Central/Far East Asian markets. a) Ukraine’s an emerging/frontier market: Sure, trace the US/European credit/housing collapses (or the current sabre-rattling with Iran) back to the influence of lobby groups and general political pandering. Think about Western corporate/banking pay scandals. Reflect upon the scale of market collapses in the West in 2008… Do you really still think emerging markets are more corrupt and/or volatile?! And don’t you think growth in the emerging markets will far exceed that of the West, which has to cope with debt de-leveraging for years to come? b) The Ukrainian hryvnia: Yes, it’s certainly not the most trusted currency, and it doesn’t have the same commodity resource backing that, say, the Russian ruble has. Actually…the currency’s been rock steady for the past 3 years! And if the UAH devalued, Avangardco’s combination of local costs and increasing exports would likely prompt a jump in profits/market value. Incidentally, 95% of their cash is held in dollars. c) Bio-Security: Poor weather conditions & disease are potential risks you can’t escape when investing in any agri-business. Avangardco’s facilities increasingly conform to international standards, they’ve never had a major disease outbreak, and their farms/operations are widely dispersed throughout Ukraine to lower the potential risk of disease spreading. d) Governance: To add insult to injury, Nataliya Vasylyuk (CEO) is actually Bakhmatyuk’s sister! But so what, he clearly holds the reins anyway… And his record to date has actually been pretty good: The company has stated its commitment to international governance standards, related party deals have been cleaned up/eliminated since the IPO, KPMG was appointed as auditor, and lots of media scare stories (buying US poultry companies, deposits in related party banks, getting into cattle raising, etc.) have proved to be untrue. The company even recently approved a share buyback programme (though I think the company will prefer to direct cash towards growth/capex). They’ve attended 3 investor conferences so far this year, and investor disclosure’s eggcellent! Drill down on their website, look at their latest presentation, or even just look at this databook! How many Western companies could manage this?! The transfer of his shareholding to ULF made me pause, but on reflection I concluded a merger was always on the cards anyway… All in all, I have to think Bakhmatyuk’s incentivized to treat external investors fairly, even if it’s only to help support his obvious growth plans/ambition. Biological asset fair value gains are included, as per international accounting standards. If these gains are a significant earnings component, and cashflow looks dramatically different, I normally prefer to exclude them. However, Avangardco’s fair value gains amount to only about 10% of operating profits so I’m comfortable keeping them in. Revenue growth’s spectacular, with almost a 75% increase in the past 2 years! This has prompted steady increases in the gross margin to 40.4%. Operating profit margin’s held relatively steady at 41.8%, however, as G&A, distribution and other expenses have ramped up to support the company’s growth/public status. Incidentally, operating margins exceed gross margins as operating expenses are more than covered by government grants/incentives/special VAT treatment. Poor growth in 2011 net income is due to the dramatic YoY change in net interest. This was down to their $200 million 5 year 10% Eurobond issuance in 2010, plus the elimination of high-earning UAH deposits with a related party bank. This isn’t a factor in 2012, so future revenue growth should fall directly/be magnified in the earnings line. On the other hand, if there’s any abatement of government ‘assistance’, this could prove an earnings drag. This makes v pleasant reading! Net debt’s low, gross debt’s mostly comprised of their Eurobond (maturing in 2015), and operating cashflow pretty much reflects what we’d expect from the P&L. Capex was high, as you’d expect from this early stage/high growth business, but still allowed for significant free cashflow – not something I’d have expected! This year should see capex peak at $300 mio so, despite significant 2012 operating cashflows, this spend will probably require a drawdown on their cash. 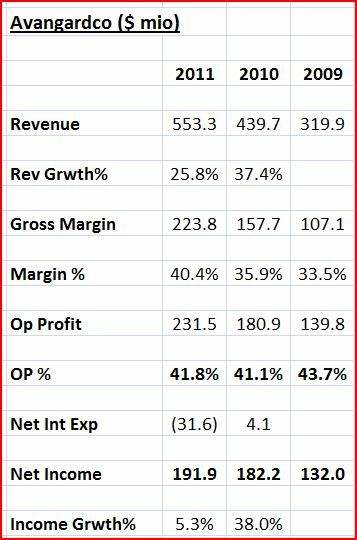 But with little interest income earned on this cash, and good operating profit growth, I’d expect their current 13.7% Net Interest to Operating Profit ratio to actually improve in 2012. Looking ahead, what can we expect? First, bumper harvests offered Avangardco the chance to lock in most of their 2012 grain purchases at v attractive prices. Second, we’ll have to see how things develop with Ukrlandfarming. ULF’s a leading Ukrainian agri-business focused on the cultivation of grain crops and sugar beet. They also breed cattle for beef, milk and leather. Last, and certainly not least, they manage 480,000 hectares, one of the largest land banks in the Ukraine. Wow, that’s absolutely immense, it’s larger than Rhode Island and three times the size of London! At the time of Bakhmatyuk’s share transfer, the following Avangardco benefits were highlighted: a) increased economies of scale from combined grain purchasing operations/storage, and an option to source fodder grain from ULF, and b) marketing synergies as its products are cross-marketed to ULF’s domestic & international customers. ULF’s long been rumoured as an IPO candidate, so prepping for this should create a decent ‘push-pull’ tension, thereby keeping inter-company pricing fair for both parties. Actually, page 28 of their recent FY 2011 presentation just offered up the first tangible insight into a possible path forward. It’s worth quoting in full: ‘AVGR shareholders will be offered an opportunity to convert into shares of ULF at IPO of the latter. This is planned to be a voluntary offer that will allow existing shareholders to gain exposure to a larger and more diversified food commodity and food products play with greater liquidity at capital markets‘. Of course, we don’t know ULF’s financials, but this could potentially offer an interesting and cheap entry into ULF and its IPO. It doesn’t necessarily preclude a reverse takeover either… At worst, it will hopefully offer a reasonable/fair transaction for Avangardco shareholders to ensure a successful ULF market listing. Finally, Avangardco’s embarked on a major capex programme to complete its new state of the art Avis & Chornobaivske facilities by 2013. This will increase their flock to 28.9 million birds, and production to 8.2 billion eggs annually. With an increasing domestic market share, and exports (to a limited number of countries) growing quickly, Avangardco’s confident this capacity will be absorbed by continued sales growth in the next few years. But here’s the kicker, Avangardco offers a major (regulatory) catalyst for investors. It currently has no exports to Russia or the EU (the largest global importer of eggs, by far)! Think about the size of those markets… Then think about Avangardco’s development to date, its state of the art capacity coming on-line and its inherent cost advantage. This is potentially an absolutely gigantic opportunity for the company, and it is completely neglected in its current valuation..! To make this even more compelling, recent EU directives (on flock welfare) have whacked EU egg capacity, and pushed up egg prices nearly 50% YoY in Feb as a result. This w/e, I was surprised & delighted to see Barron’s carry a small piece on Avangardco, highlighting this very opportunity. Of course, it’s not as simple as loading up an articulated truck fleet… With the short life & food risk presented by eggs, it’s all about meeting standards and obtaining the necessary export permits. Avangardco believes it has compliant facilities and standards, but the company (and Ukraine) is still awaiting EU export permission, and it’s also seeking permission to export to Russia. But we’re not talking about an FDA pharmaceutical approval here..! I think we can reasonably expect approval(s) to be granted in due course. Worst case scenario, the company continues with its current growth strategy and I see no particular reason/room for a valuation downgrade. At the very best, approval and a decent EU & Russia market share could swamp Avangardco’s new capacity! This would probably require capacity expansion and new shareholder funding, but I think that would be more than offset by positive investor reaction to the news and growth prospects. Incidentally, you may also want to consider the Eurobond (78MA:LN) – Fitch recently reaffirmed its ‘B‘ rating. Precious few trades have been reported, but indicative pricing’s at $77.50 which offers a 19% YTM. Personally, I believe a bond investment here faces pretty much the same risks as equity, so I prefer the greater potential upside inherent in the shares. I currently have a 2.6% portfolio holding in Avangardco.